Stacy Adams Madison shoes are a way to look back in mens fashion but be able to appreciate them on your own feet. You're looking at the 1920s style shoes that made Stacy Adams Shoes the famous name that it is today. These cleanly styled vintage old school looking cap toe shoes are called the Madison. People started referring to them as the biscuit toe by the unique shape of the cap toe that distinguishes them from other cap toes available. Stacy Adams Shoes created the Madison over 100 years ago. Back when streets were not even paved and if you saw an Automobile, chances are it was a Ford Model T that was hand cranked. 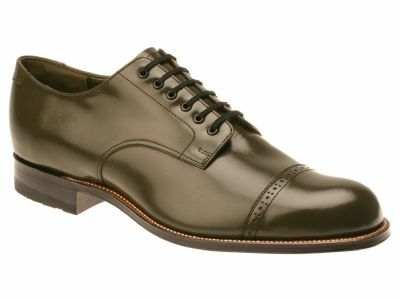 These dark olive color Stacy Adams Madison shoes feature the easily recognizable biscuit toe cap toe look that is made of kidskin leather that is both soft and durable with their genuine leather sole with Goodyear welt construction that adds both natural cushion in the cork filler and durability. Read Articles on Stacy Adams Madison Shoes.